Slovakia is a member of the EU and so it records its national accounts following standards laid down in the Maastricht Treaty. The national debt it logged as the debt accumulated by all levels of government. The debts of the private sector are not counted as part of the official national debt. Not all public sector debts are included either. The rules on the declared national debt specifically refer to those debts created by formal debt agreements. That means debts created through bank loans and the debts raised through the sale of government securities. How are debt figures compiled? There are a number of gray areas when calculating national debt. For example, the debts of state-owned enterprises are treated as part of the private sector. However, certain government agencies, such as infrastructure development corporations, could be counted as public works departments with their debts counted as part of government debt, or as state-owned enterprises with their accounts treated as part of the private sector. The guarantees given by the Slovak government to underwrite loans taken by enterprises and institutions is another area that is not treated consistently when compiling national debt figures. Some economic organizations count these guarantees as part of the national debt, while others do not. The IMF doesn’t include government loan guarantees in its national debt calculations, whereas the OECD does. The accounting rules followed by Eurostat are the same as those used by the Slovak government itself. These rules include government guaranteed to EU bodies, such as the European Investment Bank and the European Financial Stability Fund, but it does not include the value of loans underwritten by the government to businesses and institutions within the Slovak Republic. How is the Slovak national debt valued? The different methods of valuing the debt work on assumptions of how much it would cost for the government to pay off the debt in the year of the assessment of national debt instead of letting those debt instrument run to maturity. The face value of bonds is the amount that they were issued for. In the case of fixed-value bonds, this is also the amount that the government will have to pay back on the maturity date. Index-linked bonds increase in value each year in line with a given index. That means that in each year up to its maturity, the amount that the government is liable to pay gets a little higher than the face value. This is the nominal value. Slovakia doesn’t issue index-linked bonds, so the nominal value of the country’s bonds is the same as their face value. The government of Slovakia does issue bonds in foreign currency, so the nominal value in those examples are the original face value converted into the Slovak currency, which is the Euro. 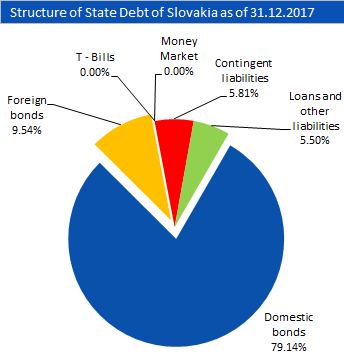 The nominal value of Slovakia’s bonds is important because this is the value that the government of the country uses when compiling its national debt figure. This is also the method that Eurostat uses. As soon as bonds get released onto the secondary market, their values change. Investors are often willing to pay more than the face value of bonds issued by some countries. This is the market value nd is the figure that the IMF and the OECD use when valuing the national debt. These institutes argue that if the country intended to pay off its debt today, the government would have to buy back its bonds on the market, rather than just cancelling them. So, the IMF and the OECD value the Slovak national debt at a higher level than the country will really have to pay when it eventually pays off its bonds on their maturity dates. Where did Slovakia’s national debt come from? The Slovak Republic, also known as Slovakia, has had a recent economic history that is typical of post-Communist Eastern Bloc European countries. After splitting from Czechoslovakia in 1993, the country struggled to purge its ruling elite of crony capitalism. Once a Western-looking capitalist government took power in the late 1990s, the economy took off, fueled by inward investment. 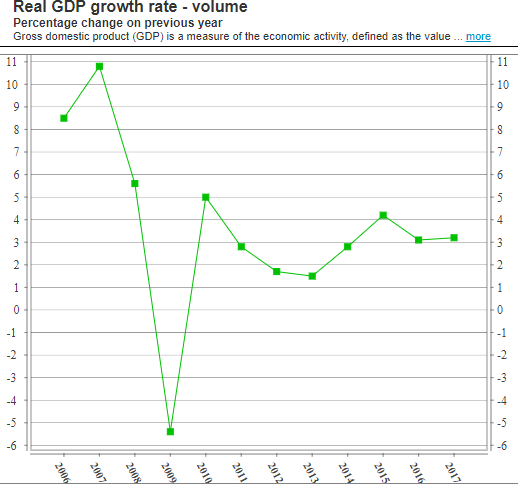 The economy grew very quickly with GDP increases peaking at growth of 11% in 2007. The global financial crisis of 2008 caused international traders and lenders to retrench and foreign investment in Slovakia dried up, causing the country’s GDP to fall for the first time since its independence. After the one year of recession, the country returned to growth. However, subsequent years have seen growth rates more like those seen in mature economies. In the absence of investment from abroad, the Slovak government had to make up the difference, borrowing money on its own account in order to reflate the economy. This action resulted in severe budget deficits for several years. 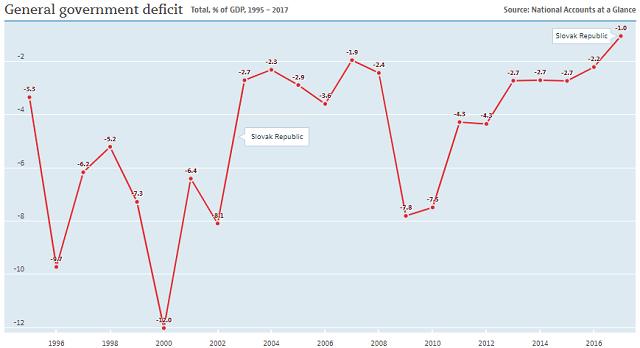 Slovakia joined the EU in 2004 and the short-term policy of running large budget deficits from 2009 to 2012 broke EU rules, which stipulate that deficits should not exceed 3% of GDP. However, this rule was broken by many EU nations during that time. 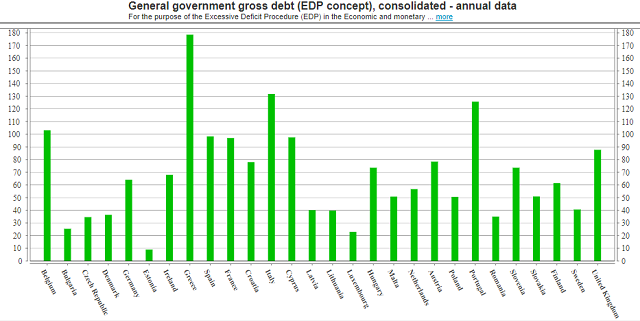 A second EU debt rule is that the national debt should not exceed 60% of GDP. 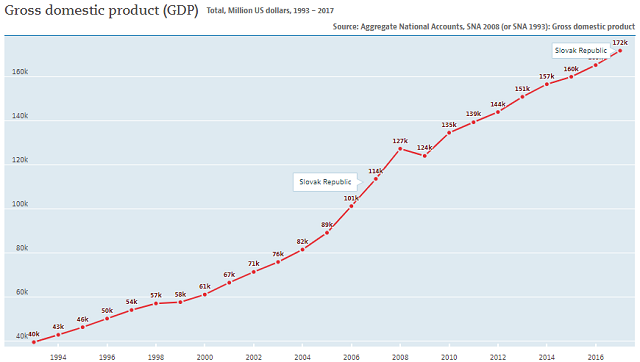 Between 2008 and 2013, the Slovak government almost doubled the national debt by Eurostat debt to GDP measures from 28.5% in 2008 up to 54.7% in 2013. 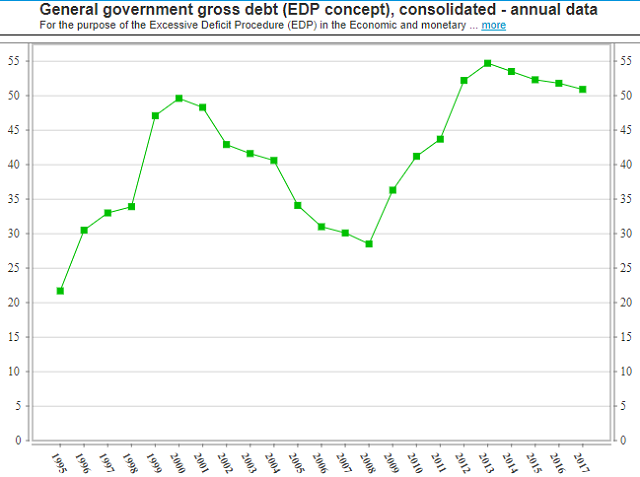 However, this peak level of national debt still kept Slovakia within the guidelines laid down by the Maastricht Treaty. That is a target that many EU governments have failed to achieve. What is Slovakia’s credit rating? Slovakia has a good credit rating, so its troubles in the financial crisis have not affected the value of its debt. The three major ratings agencies all give the country an A-grade rating. While not being the very top grade of rating, which is “AAA,” the A+ rating is still very respectable. The table below shows the current credit rating awarded to the Slovak Republic by the world’s three largest credit ratings agencies. The “outlook” status indicates that none of the agencies expect Slovakia’s rating to change within the near future. Who manages Slovakia’s national debt? The Slovak government’s Ministry of Finance is responsible for managing the national budget. This annual budget expands the national debt by including deficits. The government of Slovakia consistently spends more than it receives in income. The difference between these two figures has to be reconciled by debt. The ultimate authority on the assumption of debt it the nation’s parliament. The government has to seek the approval for its annual budget and other economic policies. The division of the Ministry of Finance that monitors the national debt is called the State Treasury. However, most of the government’s debt management functions are implemented by a separate agency, called the Debt and Liquidity Management Agency, or Agentúra pre riadenie dlhu a likvidity (ARDAL) in Slovak. How does the Slovak government raise loans? ARDAL sells government securities through an auction process. Auctions take place on an electronic platform, which is called State Treasury Information System (STIS). ONly authorized buyers are allowed access to this system, which forms the primary market for government security. These buyers are called “Primary Dealers” and they are expected to resell their allocations on the secondary market. The “market making” functions of the primary dealers makes Slovak government securities available to all. The secondary market is another electronic platform, called MTS Slovakia. Treasury bills do not pay interest. They are sold at a discount and redeemed at face value. The largest amount of Slovakia’s national debt was raised through domestic bonds. Both domestic bonds and bonds issued overseas pay a fixed rate of interest for their lifetimes. Overseas bonds have been issued in Euros, Swiss Francs, and Norwegian Krone. What facts should you know about Slovakia's national debt? You could wrap $1 bills around the Earth 221 times with the debt amount. If you lay $1 bills on top of each other they would make a pile 6,194 km, or 3,849 miles high. That's equivalent to 0.02 trips to the Moon.